Just in time for Christmas, Apple has added a gifting feature to its iBookstore opening up a new option for people who are short on present ideas for iPhone and iPad fans in their life. 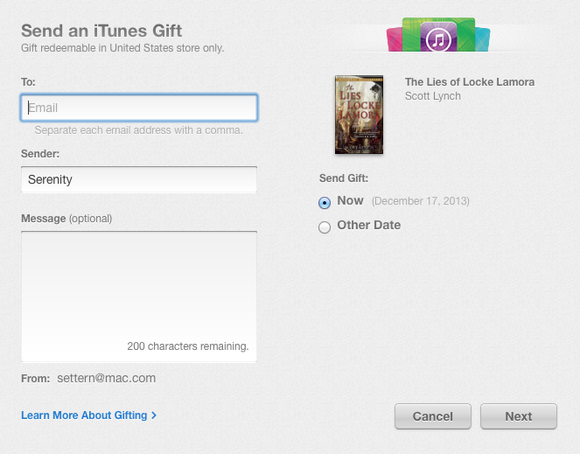 First spotted by Macworld, sending a gift in the book store works just like in iTunes or the App Store. A new dropdown menu on each book lets you enter the details of the person you are sending it to: their email address, your name and a message. There’s also the option to select a date to send it over. Like other Apple services, gifting only works between people whose Apple/Mac accounts are in the same country — another reason to get a ‘home’ account for your device if you live overseas.